Dhoni Mighili's personalised philosophy caters to elite guests' desires, whether midnight champagne of a special vintage, an afternoon of spa treatments, diving with sea turtles, sunset fishing, or deserted island snorkelling. For ultimate privacy, the entire island can be booked for exclusive use. 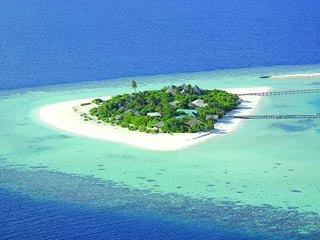 Dhoni Mighili is in the Ari Atoll of the Maldives, to the southwest of the capital, Malé. Your Maldives experience can begin with a breathtakingly gorgeous journey to Dhoni Mighili on a 30-minute seaplane flight over the necklace of atolls glistening in the Indian Ocean. Or, of course, the most decadent way to arrive would be aboard your own private Dhoni where you can revel in sunshine and the sensation of the sea gently spraying against your skin to get you straight into the holiday mode that you have been longing for. Dhoni Slamber There are only six luxuriously appointed, air-conditioned Dhonis, each partnered with its own intimate Beach Bungalow featuring outdoor bathroom and waterfall showers. Embodying the grace and romance of the Maldives, these 65-feet Maldivian sailboats, handcrafted by local artisans, have both the traditional ivory sail and a motor. Sail or cruise – the choice is yours. The bow of the Dhoni is inviting with comfortable day beds overflowing with cushions to laze in the Maldivian sunshine. At night your Thakuru will transform the deck into a sensual setting for dining under the stars while out at sea. A king size bed with Frette Linen and goose-down duvet graces the cabins. The Dhonis also boast SMEG kitchen appliances, Philippe Starck bathroom fittings, a sunbathing deck and silk cushions. In-cabin entertainment includes a 20” LCD screen with Bose DVD surround sound theatre. 2 Luxury Dhonis with Beach Bungalow With their elegant simplicity, these thatched bungalows are set amongst luxuriant tropical foliage facing the pristine ocean to engage all of the senses. The bungalows are air-conditioned, have an overhead fan, espresso machine, private bar, outdoor dining setting and Bose sound system with an ‘Apple iPod'. The bathroom is graced with L'Occitane en Provence products. A deep bath leads to a secluded courtyard with a tropical shower open to the sun and stars. 4 Luxury Dhonis with Beach Bungalow and Plunge Pool While similar to the Beach Bungalows and with the same features, these four individual beach bungalows offer a much larger private courtyard with your very own private freshwater plunge pool. Water Sports Aquatic diversions of every style. Kayak through the lagoon. Sail the ocean. Spend the morning peering at the colourful underwater world as you snorkel the reefs. Or feel exhilarated with an afternoon of windsurfing. Complimentary non-motorised water sports. Diving Canyons blanketed in brightly hued coral. Schools of fish. The graceful sight of mantas with wings outspread. An energising encounter with grey reef sharks or the inspiring spectacle of massive but gentle whale sharks. Your personal Scuba Diving Instructor accompanies you and your partner onboard your personal Dhoni and takes you to see whatever you want to see. He will guide you to the undersea highlights of the Ari Atoll - entirely at your leisure. whenever, wherever. Destinations Sunset fishing. Deserted island snorkelling. Local island exploration. Endless holiday destinations with Dhoni Mighili. Sail the Ari Atoll aboard your personal dhoni. Dine & Wine Wherever, whenever you wish to dine or wine on Dhoni Mighili, the choice is yours. The Chef can suggest a menu specially designed using the freshest of fresh ingredients or can personalise a menu to excite your palate. Find a secluded part of the beach and select your menu ... dine on your Dhoni or in your Island Bungalow...dine on a deserted island or a pristine sand bank...or simply dine in the restaurant, any time of the day or night.. This is your island getaway and you choose how to enjoy your time here. Bar & Lounge The bar is open 24 hours for guests to help themselves to the finest selection of champagne, wine, spirits and imported beers that have been meticulously selected by our Master of Wine. There is always a host on hand to mix the perfect margarita. An extensive Reserve Wine list is also available.